At the near-tip of Manhattan on the site where the Dutch West India Company built Fort Amsterdam to defend themselves against Native Americans sits one of the most monumental of New York structures. The greatest source of revenue for the United States Government before the creation of income tax in 1916 was the collection of customs duties. 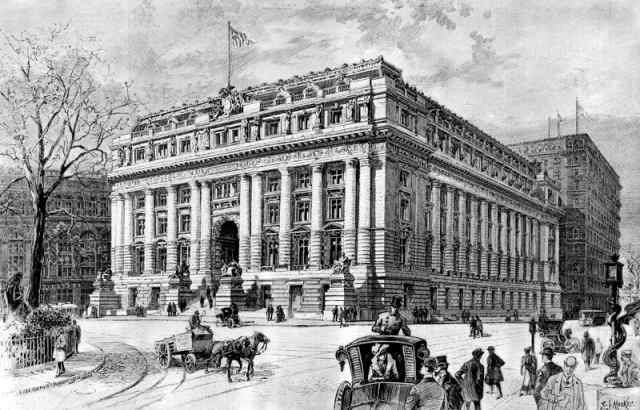 As the 19th century came to a close there was a need for a substantial new U. S. Customs house in New York City. In 1899 once-elegant row houses, since converted to office space, lined the site of the old Fort Amsterdam. The Federal Government took ownership and the Department of the Treasury sponsored a competition for the design of the new Customs House -- and sparked a controversy that would last for years. The Customs House was the first major competition under the 1893 Tarnsey Act that allowed architects to compete for the design of civic structures. 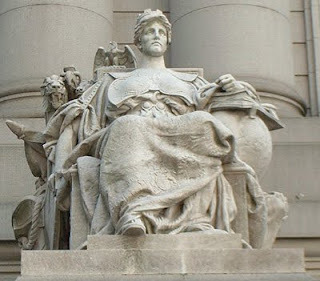 The competition ended in a tie between Cass Gilbert, from Minnesota, and the New York City firm of Carrere & Hastings. While the jury requested the finalists to submit further developments to their designs, Carrere & Hastings suggested to Gilbert that they join forces in the project and that they request the jury be enlarged. Gilbert, who wanted this plum commission for himself, refused on both counts. After resubmitted designs, much deliberation and Gilbert's paying his lawyer $5000 in legal fees, Cass Gilbert won the commission. Coming amid the City Beautiful movement which stressed monumental, decorative buildings, Gilbert's design was exactly that. 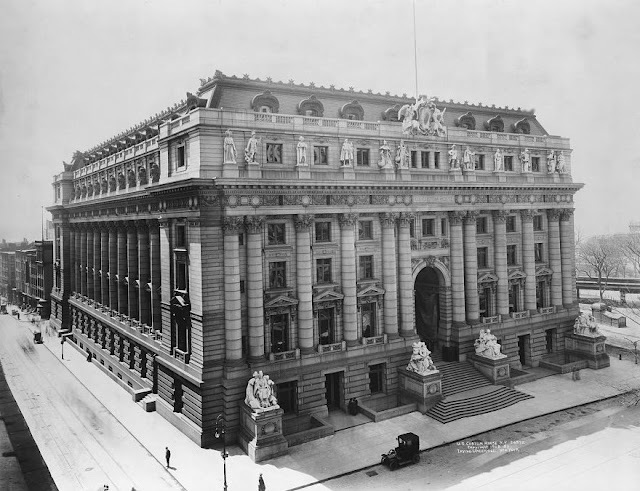 Seven stories of Beaux Arts-style gray Maine granite covered three city blocks and contained 450,000 square feet of space. Drawing his inspiration from the Paris Opera, his building would be as lavish as it would be massive. Critical to the architecture was the sculpture. Four colossal seated figures representing Africa, Asia, America and Europe would decorate the front facade. So important were these allegories that each had a separate contract, the commissions all being awarded to Daniel Chester French. Above the 12 three -story high columns are statues representing the sea powers of the world. In dramatic contrast to the gray granite facade, the sculptures were executed in brilliant white Tennessee marble. America rests her foot on Quetzelcoatl, the feathered South American serpent god. A Native American watches over her shoulder. Corn, wheat, cacti, a buffalo skull and a broken Native American pot symbolize the United States. Next to her Labor rolls the wheel of progress. Along the sides of America's throne are Mayan glyphs. 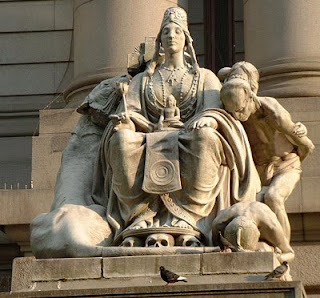 The statue of Asia reflects the political views of the period. Her feet rest on a stool supported by human skulls, symbolic of the many lives lost in Asian slavery. In one hand she holds a poppy while a statue of Buddha sits in her lap. Behind her a cross is emerging, denoting the rise of Christianity and missionary work at the time. Three miserable figures, one curled on the ground with his face in the dirt and one with his hands tied behind his back represent, in French's words, "the hordes of India, and the hopelessness of the life of so many of the inhabitants." A large tiger wraps behind the throne. Europe sits on a throne decorated with fragments of the frieze of the Parthenon, her left hand grips the bow of a ship with a lion's head, representing Europe's many conquests during the Age of Discovery. Her right hand, in a fist, rests on a globe -- a symbol of her many colonial take-overs. Behind her a shrouded figured depicting ancient history contemplates a human skull. Finally Africa, referred to at the end of the 19th century as "the sleeping continent" slumbers in her throne accompanied by a sleeping lion. To her left is the head of a sphinx, while behind an eerie shrouded figured represents the mystery of Africa. 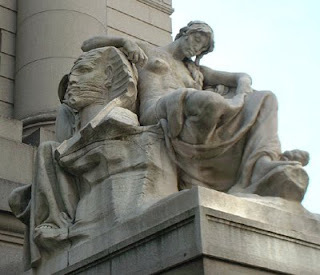 No single artist was commissioned for the remaining sculptures of the facade; rather, some of the most noted sculptors of the day were employed: Augustus St. Gaudens, Albert Jaegers and Vincenzo Alfano, for instance. The construction began in 1902 and would continue for another five years. On January 11 of 1902, Harper's Weekly wrote "Preliminary work on the new Custom-House, at the foot of Broadway, is well advanced, and portions of the steel frame-work are in place. 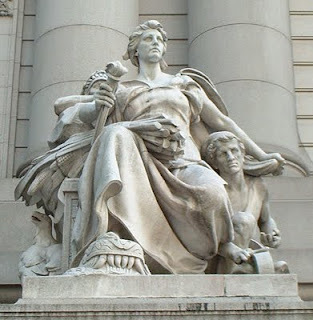 The edifice is to be of marble, and to cost approximately $3,000,000. Directly in front is the Bowling Green, of historic memory, and great buildings tower to the sky in the immediate neighborhood." E. J. Meeker's illustration of the proposed building may have been the first glimpse most New Yorkers would get of the grand design. The interior of the Custom House was a lavish as the exterior. The rotunda remains one of the largest public spaces in New York. Over the ornate room a 140-ton skylight was engineered with no visible means of support. In 1936, during the Great Depression, the Works Projects Administration commissioned Reginald Marsh, as part of their Treasury Relief Art Project, to create murals for the rotunda area. 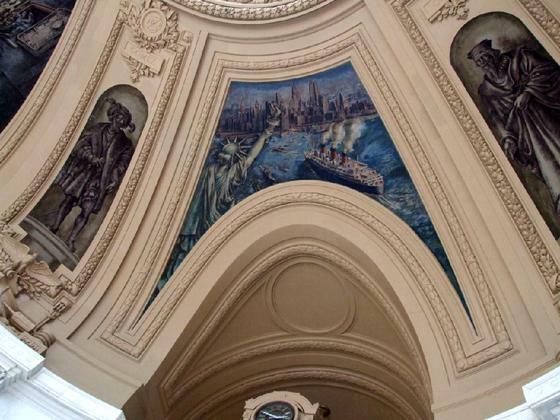 Eight large panels exhibit scenes of the Port of New York City. One especially interesting panel includes motion picture actress Greta Garbo leaving a passenger ship and greeting the press. The smaller eight panels depict famous explorers -- painted in shades of brown and gray to simulate statuary. The 1970's in New York was a dark period for landmark preservation. The city's critical financial problems caused structures in Central Park and elsewhere to fall victim to neglect and vandalism. So it was for the Custom House. In 1973 the Customs Service abandoned the building which sat empty and ignored for nearly a decade until plans were finally initiated for its demolition. In a last minute rescue, Senator Daniel Patrick Moynihan sponsored a bill appropriating nearly $30 million for the restoration of the old Customs House. Because of the variety and quality of the artwork, preservation efforts involved a series of subcontracts. Painstaking research was done on every piece after which individual curators recommended methods, tested those methods, and then conserved the art under the watchful eye of experts. The Marsh murals, for instance, were unable to be cleaned; the sand-rich plaster on which they were painted being far too delicate. 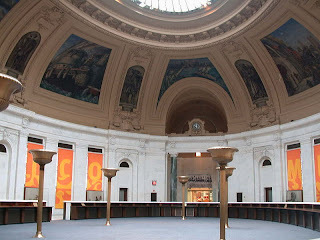 Today the United State Customs House is the home of the George Gustav Heye Center -- National Museum of the American Indian, a branch of the Smithsonian Institution. truly amazing. Its a great relief to learn all this artwork was saved. I attended the 1997 American Indian Film Festival at the the Heye Museum, so I was hanging out at the old Customs House all that week (When I was a kid, the museum was in a mansion up in Harlem). The first night, I crashed a reception in the rotunda! I think the skylights may have still been blacked-out from WWII at that time, but not sure because it was dark outside. It was a great festival that year, NMAI on the mall in D.C. hadn't arrived yet so NYC's Heye was the whole shebang. But some afternoons, I would stand out by the patch of Bowling Green, look at the Customs House and try to imagine the fort that was there and wonder the spot I stood on would allow me to see the Lenape's heads on pikes that once decorated its parapet. And also the cross-dressing Governor who once strolled the grounds! But it is ironic the the site of the fort which fought against First Americans is now a place to celebrate that culture. Perhap's that is what the Indian is whispering in statue America's ear, "We'll move back in when you're finished with it!" LaGrange Terrace -- "Colonnade Row"